For months now I have been walking around, looking and acting normal. But behind that normal was a knowledge and an anticipation that I couldn't share. 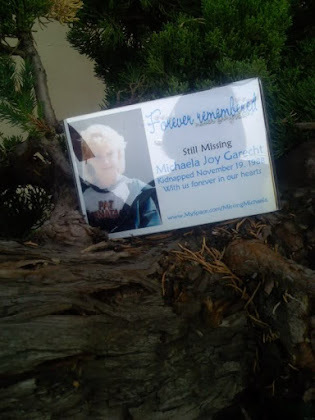 Some months ago a site was was discovered where it was thought Michaela might have been buried. I'm not going to go into all the details, but a few things converged to make this likely. At any rate, the wheels of justice moved slowly on, interrupted by some drastic current events within the investigating department, and I waited. Today I received the call from our detective, letting me know that the site was finally investigated yesterday, and nothing was found there. What do I say to that? What I wanted to say is, how deep did you dig? How wide? Are you positive it was the exact right spot? In the end, however, I was left mute. There are some things in life there is no point in questioning, I have learned. The FBI, which conducted the dig, is one of them. So I just said, "Thank you for letting me know." It has been less than an hour since I heard that news, so it is still settling in with me. It is just at this very second that the tears are starting to fill my eyes. This is a first for me. 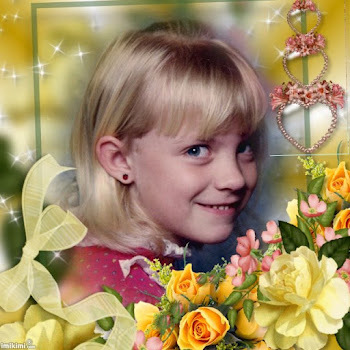 There have been a number of times when it seemed possible Michaela's remains might be found, and every single time I received the news that this hadn't happened, I had been overcome by relief and elation. But that is not the case this time. It will probably take me awhile to sort out how I am really feeling, but honestly I had been hoping for an answer, for some resolution, for some relief from this exquisite torture. Awhile back I found a meme on Facebook that gave me an aha moment. 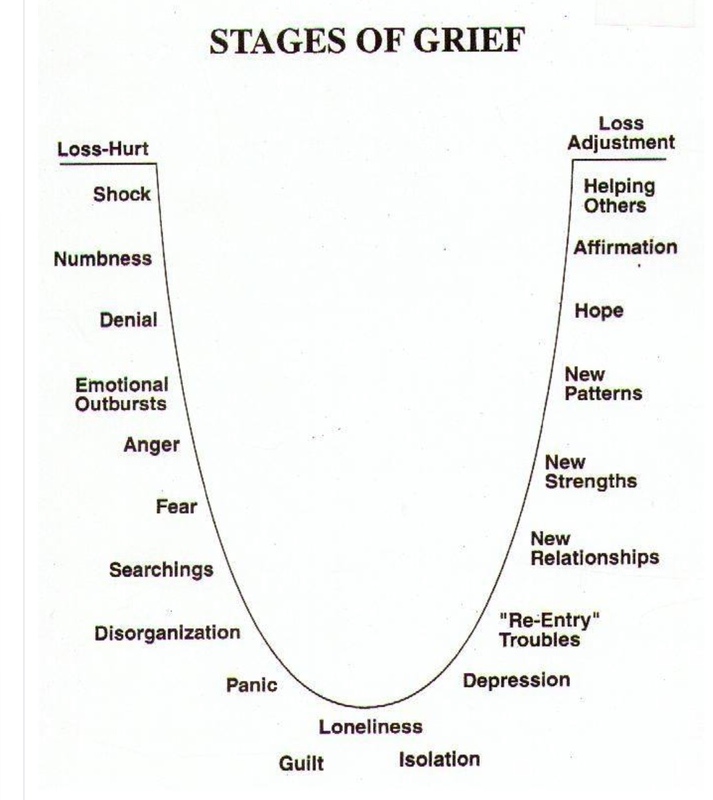 It depicts the stages of grief in a horseshoe, the stages leading down to the bottom and then the ones on the climb back up. I looked at it and saw myself stuck, like a marble rolling back and forth in the bottom of the curve, between searchings, guilt, loneliness, isolation and depression. I posted the meme with this statement and as one of my friends said, this is pretty obviously due to the fact that I have been robbed of the opportunity to process my grief, because Michaela is still missing. 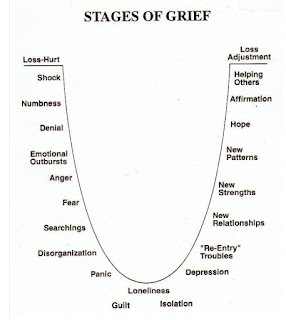 I cannot go through the stages and move on. Sometimes the marble bounces higher. Sometimes I move back up to numbness, anger, fear. I try to claw my way up to helping others, and occasionally an upswing will lift me there. But always that marble settles somewhere near the lowest point. I cannot think of Michaela dying. Those thoughts are just too awful. I cannot think of Michaela living. There are too many awful thoughts there as well. I can think of Michaela as the little girl I knew and held in my arms, but accompanying that is a sensation that is difficult to describe. It is a sense of the injustice, although that word doesn't begin to encompass the magnitude of it all. I was given the gift of this beautiful child to care for. Michaela was given the gift of life. But it was all a lie in the end. It was all something that could be stolen away in a moment. The other day I saw a lightbulb fall against a wall, and when it hit it exploded, shattered, the light instantly extinguished. That is kind of like what this was like, the moment of impact on November 19, 1988. Well, for me anyway. The awful truth is that moment on November 19th might have been the least of it for Michaela. And again, the torture of those thoughts. Even hope is not really hope. Hope exists only in the midst of a huge bundle of fear. So I don't know what to think right now. I don't know how to feel. I'm just going to let these tears rise for awhile until they turn into that wet cement feeling I am so familiar with. The only thing I can really say is to you, Michaela, if you are out there somewhere. I am the mother. You are the child. It is my place to save you from suffering, even when it causes suffering for me. I have acknowledged that it could be possible that you might be alive out there somewhere and be unable or unwilling to come home for any number of perfectly valid reasons. But my heart is in a vise, Michaela. If you are there, if you are reading this, if you could please please please just let me know. You can post a comment here, and nobody will ever see it except for me, because I have to approve all comments before they are published. If you can identify yourself by our family code word or by something that nobody else would have a way of knowing, and let me know you are alive, I would be so grateful. If you are in another country and unable to leave because you don't want to leave your children perhaps, tell me. I just need to know that you are okay. Please. Please. Please. When you were kidnapped, along with your own fear and terror, I know you thought about me, and how it would hurt me, because that is just the kind of person you were. Please, Michaela. I am hurting. Please. My heart breaks for you Sharon. I am so sorry the new lead didnt pan out. I can't even begin to know your pain and anguish. Sending love to you and Michaela. Yes, she is. I always end with love you forever, but it's from a book, and the rest of it goes, "I like you for always, as long as I'm living, my baby you'll be." Thanks, and thanks to your kids. Oh man..I'm a mom and I can not believe how sad this is. I have never forgot your daughter. I'm so sad to know you have to live with this unbelievable greif and I pray for you and her. My heart breaks for you! Words are inadequate to even touch the depth of the pain you must be feeling and have felt for too many years! I have prayed for you and will continue to pray for you! I'm so sorry! We carry Michaela and your family in our hearts. And for you also, Marianne. Thanks. Please check out this website. 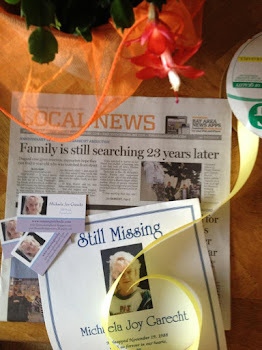 http://www.joybaker.com I think this blogger/writer helped move mountains on the Jacob Wetterling case. The police now have a person of interest. I'm so sorry for your grief. Linda, thanks, but believe me I already have a couple of feather rufflers to help me. 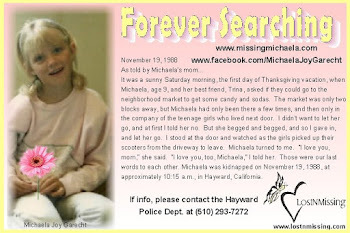 Michaela was my friend as a child and I still have pictures of her and me playing my my mother had a daycare in Hayward we were all heartbroken when she went missing I lost a good friend my heart goes out to you . Samantha, I appreciate your message, but are you sure you are not confused? I was a stay at home mom. 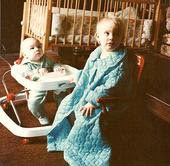 Michaela went to daycare for a short period of time when she was very young, but not for years before she was kidnapped. 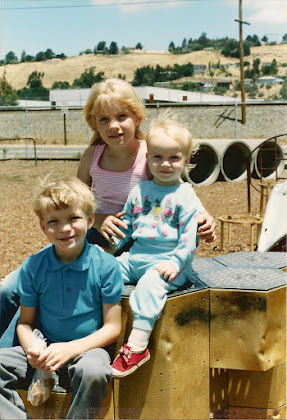 What was your mom's name, and where in Hayward was this daycare? Yes you are right. I remember your mom! Thank you everybody for your kind thought and comments. I very much appreciate it. I was Michaela's classmate at Harder school in Hayward. I don't know you Sharon but over the years I've thought about you and Michaela. Just wanted to say I love you. I am so sorry you are going through this.. I couldn't imagine life without my children.. Prayers for you & your sweet child.. Never give up. Someone some where knows something. Oh yes! Odette! I remember Michaela loved her black bean soup! That was a few years before she was kidnapped, but yes, your mom was the only daycare provider Michaela ever had. I cried as I read this, and I can't even imagine what you are going through. I don't even know what to say except to say I love you, Michaela, and your family and I am praying for a BIG MIRACLE to happen. I will never give up on Michaela coming home to you. I pray that where ever she is that she will call you. It was not related to the speed freak killers, and yes, they did investigate the shoe. Thanks Nancy. Hope has a gleam of light but fear enough to blind. I fear to have hope of Michaela being still alive because at the same time I am afraid that she is not. But it is not wrong to have hope. In a case like this you need hope. Even though that is the hardest thing of the whole horseshoe to feel. Even after finding out that another site digging did not locate her. Of course not. It would have been too unbelievable to be true. I am really sorry. It would be about time for you to get the answer you deserve. The fear wrapped around the hope is not simply that the hope might not be true. It is more that if Michaela is alive, most likely her life has been a nightmare. But you are right about that feeling that the answer can never be known, because it is too impossible for that to actually happen. Yes. But I still do hope and believe in getting the answer. Because that is all I really can do. And pray that she is either in peace with God or that her nightmare of living for 27 years has made her strong. I can't think about the painful parts either. But that is my prayer right now. So sorry Sharon, you deserve so much more than this. 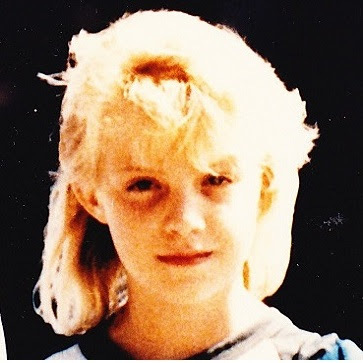 My own child went missing once for about an hour (I know, not long at all) and yet it was the worst day of my life. I cannot, cannot bear to think about how you have had to live. And poor dear Michaela .. there are no words. Much love. It's difficult to find the words to offer in a situation like this. I suppose most people's first instinct would be to say, "I'm sorry this lead turned out to be another dead end." However, if Michaela had been discovered at the site, it obviously would not have been the outcome you are hoping for. With that said, I suppose the best I can offer is to tell you that I am sorry this latest investigative matter into Michaela's disappearance has opened up another wound for you. Myself and many others - as I have seen from reading this blog - continue to wish the very best to you, Michaela and the rest of your family. Take good care. Can you make any prominent person of interest that you know public ? From the evil man,s description did they find any blonde haired man with pock marks matching the witness description ? Apart from the suspects known in the media are the police investigating people that the public do not know about ? The public doesn't know most of what is being investigated, and I cannot reveal that information. If someone knows they are being investigated itinerary can make it more difficult, and if the person is not guilty they should not have their name put in the court of public opinion. Please keep up the search at this point , from the description of this man,s car cement splatters on the side , he could have been a construction worker ? At this point I want to thank you for being a becon of inspiration to all missing kids families all over the world . Could it have been Timothy Binder? 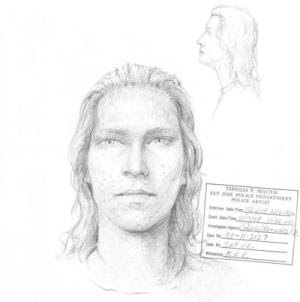 He could have stolen a car, switched license plates, had access somehow to a boxy car... and a wig/makeup. I don't personally think it was Tim Bindner. He just seems to be a guy who likes to hang out where bad stuff is happening. He has been proven not to be involved in some of the cases he was suspect in. After the earthquake in 1989 he was on TV as one of the volunteers helping to dig dead bodies out of the collapsed freeway structure in Oakland, and we know he didn't cause the earthquake. He is not completely ruled out, but he is not among the suspects that the police are currently interested in.